Dycon, a market leader in the design and manufacture of sophisticated switched mode power supplies and communications devices for use in a wide range of applications, celebrates its tenth anniversary at IFSEC 2014, the perfect venue to celebrate Dycons tenth anniversary, offering a new fresher venue, a new format and new visitors visitors from the UK and overseas. Founded in 2004, Dycon introduced switched mode technology to the security industry with a full complement of highly efficient, greener power supplies revolutionising the way green power is delivered across the spectrum of security systems and service. 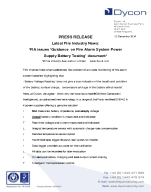 This has helped a whole raft of industries, including local government, educational institutions, and commercial enterprises, reduce their carbon footprint and lowered the operating costs of their security systems "Over the last ten years, Dycon has remained strong throughout the many changes in the economic climate," said Tony Allen, Managing Director of Dycon. "Our success can be attributed to two things: first, we focus singularly on technology by bringing our know-how and expertise to help companies innovate in the way they use power in their own applications. Secondly, we continually look for ways to optimize our operations in every area of the business. This serves both our customers and our company well, particularly during harder economic times." 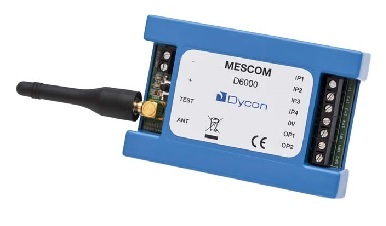 Equally, Dycons innovative, secure communications products have become market leaders in several countries across Europe, offering more reliable ways to send alarm signals from a wide variety of security and fire systems. A new product highlighting Dycons innovative approach is being launched at IFSEC 2014. MesCom2 delivers alarm and monitoring text messages direct to any smartphone enabling home owners, business managers, patrolling guards and service engineers to keep in touch with their system no matter where they are. Dycon image is changing from simply being a manufacturer of advanced power and communications products to a company that offers complete solutions to customers from uncovering a potential problem to providing a solution to it. We offer a holistic service to our customers, starting from clear and easy-to-understand datasheets with both commercial and technical information which is useful to sales staff as well as technical and engineering departments. This is an ongoing project which will result in easier and better communication channels, says Tony Makosinski, Dycons Business Development Manager.